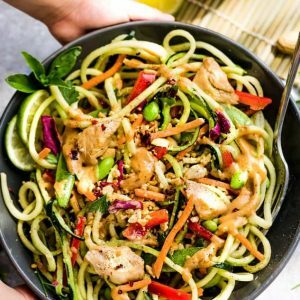 This Asian Zucchini Noodle Salad is the perfect healthy and tasty dish to use up that garden zucchini! 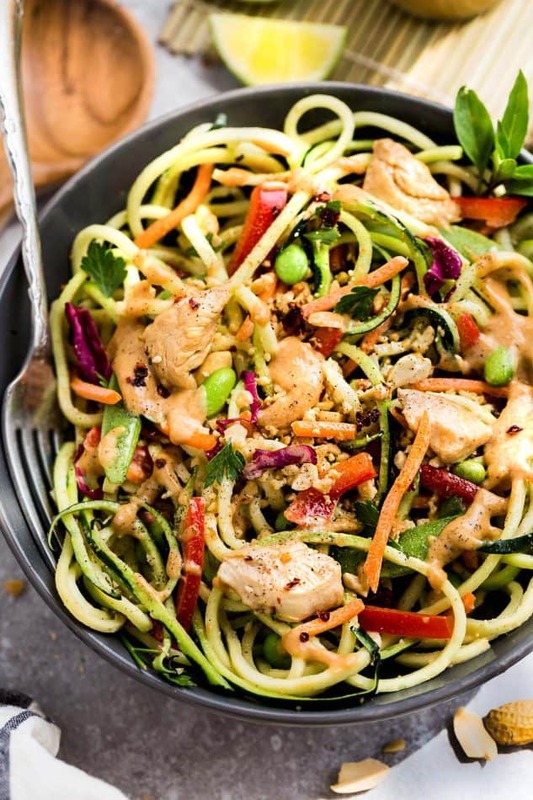 Loaded with shredded chicken, sliced veggies, and drizzled with a flavor-packed homemade Thai peanut lime dressing that’s the perfect balance of sweet, spicy, and tangy! 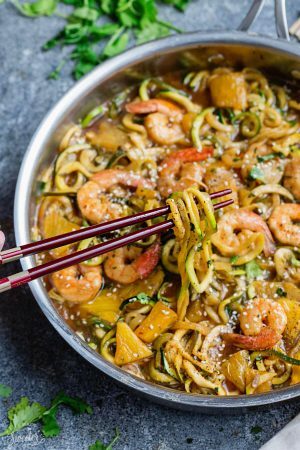 One of my favorite ways to use up that summer garden zucchini is turning them into noodles or oodles of zoodles! 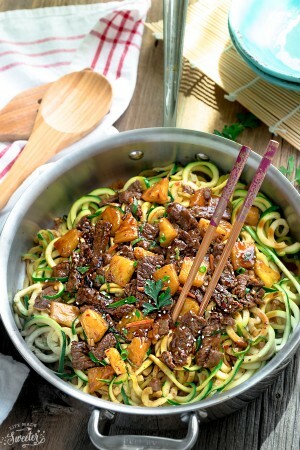 If you’re looking for some ideas on some zoodle dishes, these Mongolian Beef Zoodles, Kung Pao Zoodles and Teriyaki Chicken Zoodles are a few of our favorites. 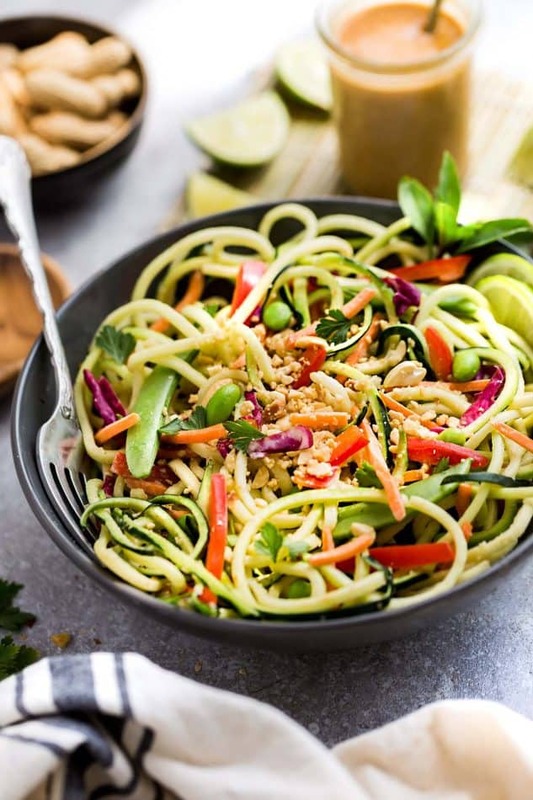 Another dish that happens a lot around here is this Asian Zucchini Noodle Salad with Thai Peanut Lime Dressing. 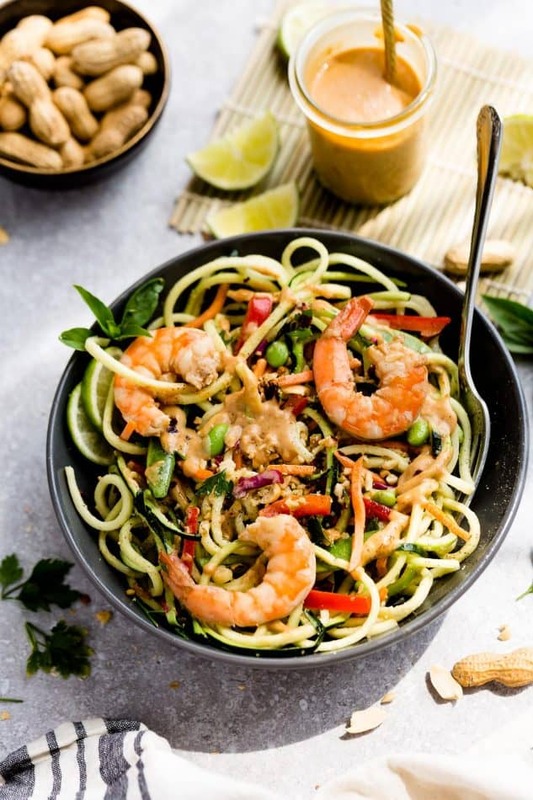 I am completely obsessed with anything with Thai flavors and this salad is full of that signature sweet, spicy, tangy and savory combo. It’s also light, colorful, crunchy, and a super delicious way to use up some garden zucchini. A summertime favorite and the best part? It comes together quickly and is super easy to customize with your favorite veggies. 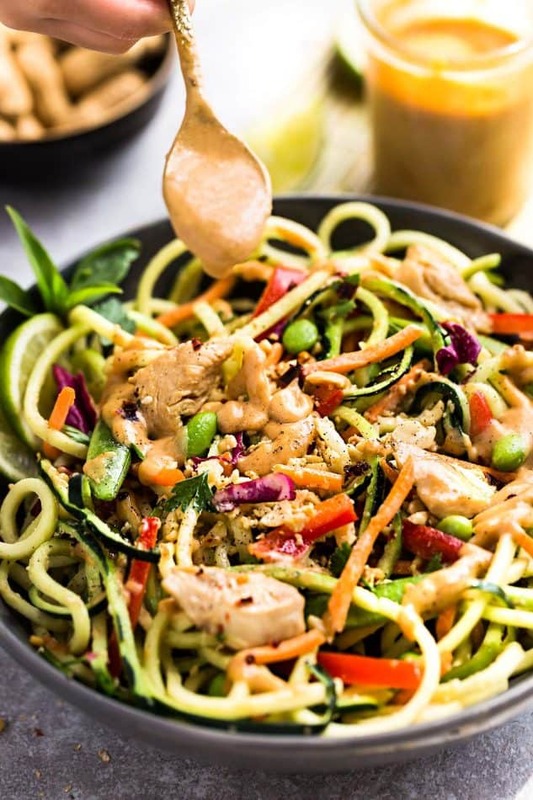 I like my zucchini noodles raw with a slight crunch. But if you prefer them slightly softer, you can sauté them in a pan for 1-2 minutes (NO longer than 2 minutes or they’ll be soggy) with some sesame oil. Add grilled or rotisserie chicken or shrimp to make it an all in one meal or leave it as is for Meatless Monday. Everything gets tossed together with a flavor-packed homemade peanut dressing. So simple to whip up plus it’s got the perfect balance of sweet, spicy, tangy and salty. 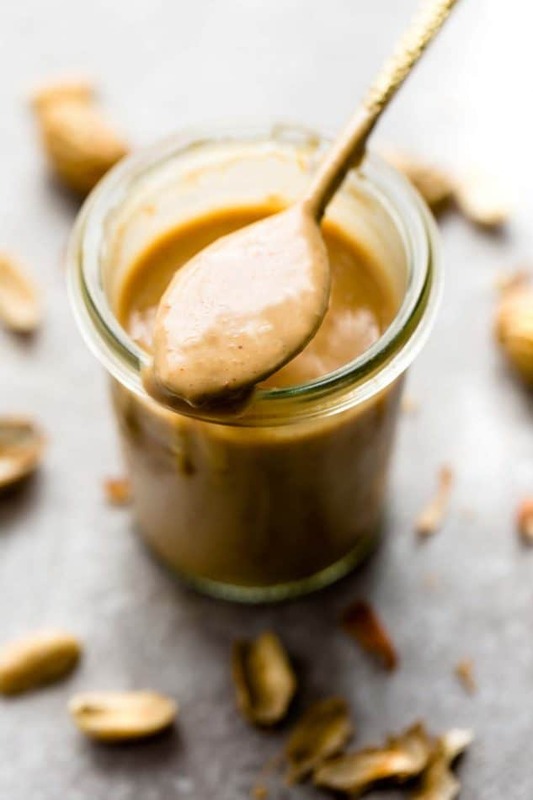 Just combine some creamy peanut butter, sesame oil, apple cider vinegar, garlic, ginger, honey and a little bit of chili garlic sauce (or Sriracha) for that extra kick of heat. You can totally adjust the amount of chili sauce to your liking or leave it out completely if you’re sensitive to heat. Make the dressing: Whisk the dressing ingredients together until thoroughly combined (or pulse together until creamy in a food processor). Set aside. 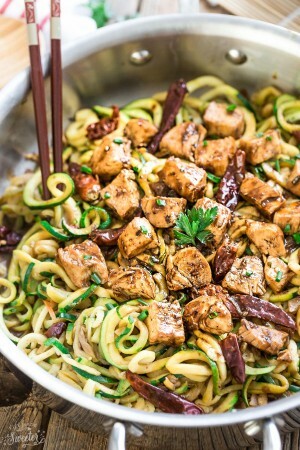 For the salad: Use a spiralizer, vegetable peeler or mandoline to make thin zucchini noodles. Add cabbage, snap peas, carrots, bell pepper, edamame, chicken and half of the cilantro and basil. Pour the remainder of the dressing over the salad and toss to combine. Top with remaining herbs, chopped peanuts and serve with lime wedges if desired. 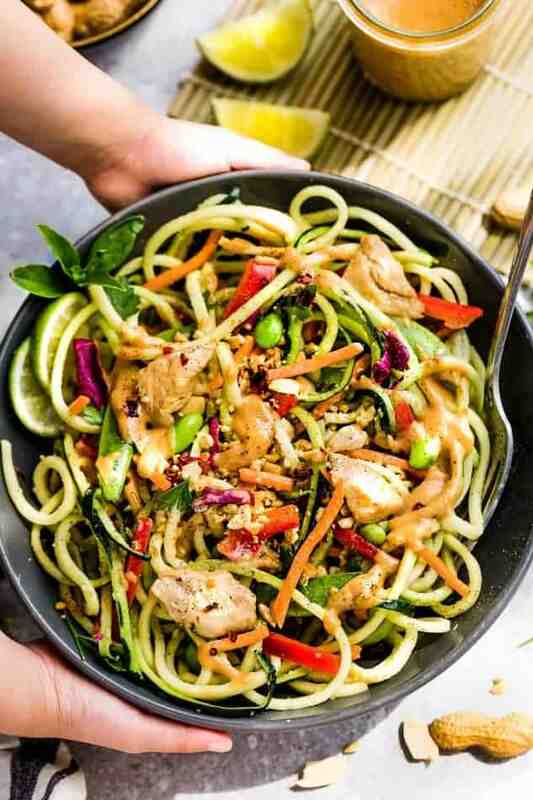 **I like my zucchini noodles raw with a slight crunch but if you prefer them slightly softer, you can sauté them in a pan on medium heat for 1-2 minutes (NO longer than 2 minutes) with 1 teaspoon sesame or coconut oil, then chill before combining with other ingredients - can be made ahead of time. Looks droolworthy, Kelly. I have to try your peanut sauce! Kelly that dressing looks so rich and creamy.